Yeah, that’s right you big, oversized elf. I said it. I’ve got some issues with you. Why you ask? Well, it may not be what you think. 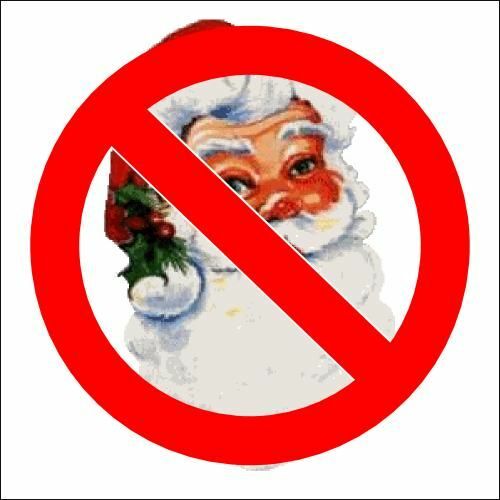 Some people don’t like Santa Claus because they say he has replaced Christ as the center of Christmas. I have always found this point of view kind of silly because many of the symbols now used in Christmas are most definitely pagan – use of trees, greens and Yuletide festivities in general are most definitely pre-Christian observances. No, I have no beef with the red velvet giant for any religious reasons. In fact, I think it’s pretty easy to use the symbolism and story of Santa Claus to enhance the ideas behind a Christian or secular celebration of Christmas. I mean, come on – the guy gives presents to kids. If you can’t find a healthy narrative in there, you aren’t trying. Others say it was the relatively modern concept of St. Nick popularized, and yes commercialized, in “A Visit From St. Nicholas” (AKA Twas the Night Before Christmas) that led to the modern insanity of the mega-retail holiday we know today. Maybe that’s true, but so what? Had Christmas not been commercialized in the way we know it today, I don’t think we’d have the beautiful cities, amazing acts of charity and generally wonderful atmosphere by Christians and non-Christians alike across the world. Is this not a net-good for society? Anything that encourages good will, voluntary giving and charity – I support whole heartedly, regardless of the reasons. Nope, no problems with Father Christmas just because he has become Mr. Wal-Amazon-Costco-Target. Keep up the good work Kringle. My issue with you is that you take away my credit. Yep, that’s right. Those gifts come from me and my wife, and we want the credit. It was our money that paid for those gifts, our time spent looking for them and our (ok, my wife’s) time that is spent wrapping them. What a bunch of crap! To make that guy responsible for the gifts at Christmas is anti-parent, I tell you…anti-parent. So this holiday season, let’s focus on the real meaning of Christmas – a better ability to blackmail children. Because nothing says peace on earth and goodwill toward men like retaining the power of lazy parenting. …my favorite time of year, even if that anti-parent bowl of jelly is involved. What was that – your “Festivus” rant? Thought it would be fun to pick on a guy who everyone loves. Very much tongue in cheek. Hopefully no one takes that seriously at all.